Still reviewing Wine of Moldova and still on the white wine theme, but this time we get back to the world’s most misunderstood grape variety – the noble-royal riesling wine. 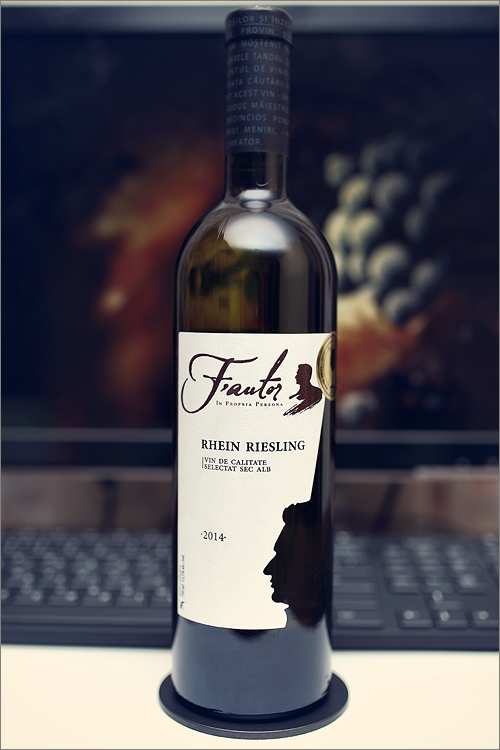 The wine that we’ve selected for today’s tasting is quite well known here in Moldova and is growing in popularity on the international scene as well, as this wine is both, delicate and mesmerizing – Rhein Riesling 2014 from F’autor. The wine has a pale straw-yellow color, with some nuanced green shades towards the rim of the glass. The nose is rich, with no signs of wine faults. The first nose is rich and insistent, with nuanced citrus and sweet fruits notes: lemon, yellow mirabelle, rubber-petroleum, acacia, yellow apple, pomelo, pineapple, green tea, gooseberry and some hints of kiwi. The wine is medium-dry, with some hints of residual sugar. It has moderate alcohol level, high acidity and soft tannin, which makes the wine taste crisp, citrusy-fresh and silky. The wine has a fair overall balance – this is a lean, oily and well structured wine, with a quite rich, but velvety body – very close to an Alsace riesling wine. The wine has a medium finish and a balanced aftertaste – a bit crisp but quite refined overall. Conclusion: this wine is quite close to it’s top form, maybe just a bit over it, with a strong citrusy profile and, which is characteristic for a true riesling wine, some hints of rubber-petroleum. This is not a wine to be kept in the cellar, as it already reached it’s apogee and right now it is on the decline slope, so our recommendation would be to drink it now, and by ‘now’ we mean right now. As a true riesling wine it pairs perfectly with soft cheese and slightly spicy dishes, like for example a honey-glazed spiced pork tenderloin. Who said that white wines cannot be paired with red meat, at least we didn’t. Enjoy.